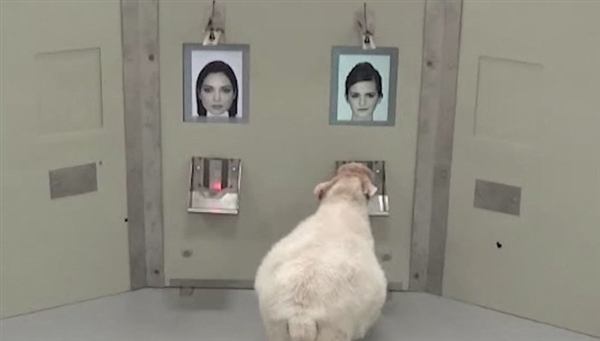 University of Cambridge scientists have trained sheep to recognize the faces of famous people. The scientists hope facial recognition may help with their understanding of neurodegenerative diseases. The researchers showed the sheep pictures of people on two computer screens. One screen had an unknown person and the other had one of four famous people. The animals were given food for choosing the photograph of the famous person. They chose the correct photograph by breaking an infrared beam near the flat surface showing the photo. If they chose the wrong image, an electric signaling device would make a sound, and the sheep would receive no treat. The sheep eventually were able to identify the famous face eight times out of every ten tries. The group of famous personalities included actors Emma Watson and Jake Gyllenhaal, and former American president Barack Obama. Professor Jenny Morton was the leader of the study. "We've shown that sheep have advanced face-recognition abilities, comparable with those of humans and monkeys," she noted. The sheep were less successful when presented with the faces at a new angle or from a different direction. However, the researchers said the performance of the animals on this test was similar to the levels seen when humans took the test. Scientists aim to use the sheep as models to study disorders of the brain, such as Huntington's disease. This disorder develops over a long period of time and affects the brain's ability to work. We can study at home by watching educators on TV or on a computer screen. The inscription of the monument has worn away over a long period of time. Liza was so frightened she couldn't make a sound. Facial recognition programs are used in police and security operations. 5. "We've shown that sheep have advanced face-recognition abilities, comparable with those of humans and monkeys," she noted. My English cannot compare with his. The flowers here do not compare with those at home. 6.Scientists aim to use the sheep as models to study disorders of the brain, such as Huntington's disease.